A group of average Japanese high-schoolers. 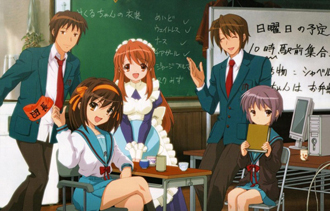 From left to right: Kyon; Haruhi Suzumiya; Mikuru Asahina; Itsuki Koizumi; Yuki Nagato. "I have no interest in ordinary humans. If there are any aliens, time travelers, sliders or espers here, come join me. That is all." Haruhi Suzumiya is the central character of a series of Light Novels by Nagaru Tanigawa featuring illustrations by Noizi Ito. A first year high school student (equivalent to 10th grade/sophomore year in the USA), she is considered beautiful, athletic, intelligent, and extremely eccentric. Haruhi has come to the conclusion that ordinary humans are, as a whole, utterly boring, and that she would rather hang out with aliens, time travelers, espers, and the like. In her quest to find them, she promptly joins all the clubs in school in a day... and quits them all just as rapidly. One day, her classmate Kyon (the Narrator) unwittingly gives Haruhi an idea: if there aren't any decent clubs, why not make one of your own? Haruhi instantly switches from an irritated, sociopathic, pompous brat to an irritating, sociopathic Genki Girl who vows to allow nothing to stand in her way. She conscripts Kyon to help her set up the club: the SOS Brigade, whose mission is to find aliens, time travellers, and espers, and have fun with them. Kyon quickly learns an explosive secret that must be kept from Haruhi at all costs, the details of which must be seen to be believed. The novels are available in English from your local online bookseller, and previews of the first three can be read at the English novel/manga website. An Anime series based on parts of the novels was released in 2006, titled after the first novel. Cries for a second season seemingly went unanswered until mid-2009, when several brand-new episodes popped up in the middle of a supposed re-run of the first season (this time done in chronological order). These new episodes constitute the "second season", and are interspersed among the old episodes according to where they chronologically belong in the plot. An English dub of the first season was produced by BANDAI Entertainment, showcasing five of the most well-known names in ADR acting. An English dub for the second season has been released, with Cristina Valenzuela as the new Haruhi of the ASOS Brigade. Also, a movie has been released in Japan for novel four (The Disappearance of Haruhi Suzumiya), which may very well be the most popular one. A trailer has appeared as well. The movie has also been licensed by BANDAI Entertainment. A video regarding this is here. Both seasons are on Crunchyroll. Episodes are not ordered as seen above. There is a manga adaptation by Gaku Tsugano (there was an earlier adaptation by Makoto Mizuno that was discontinued/disowned after one volume). There is also a self-parody gag anime released on YouTube called The Melancholy Of Haruhi Chan Suzumiya (Suzumiya Haruhi-chan no Yūutsu) based off an official self-parody manga; this aired in tandem with a spinoff, Nyoron Churuya-san, based off a certain Yonkoma that's been subject to Memetic Mutation. There is also a Spin-Off called The Vanishing of Nagato Yuki Chan (Nagato Yuki-chan no Shōshitsu) featuring Yuki Nagato as main character of a romantic Slice of Life comedy. As you might be able to tell from the length of this page, the anime in its first season became a smash hit both domestically and internationally, where it's been compared to similar ensemble absurdist comedies like Monty Python's Flying Circus. It spawned unthinkable levels of praise, with resulting amounts of Hyper Backlash, a globe-spanning Cash Cow Franchise, with fans from Japan to America to Britain to Russia to Palestine, probably the largest body of Internet Backlash in the history of all anime, and made Kyoto Animation a household name. The novels vary between several short stories and one story of several chapters, and have their differences from the anime. Usually because of the time limit the anime has, it compresses Kyon's narration process as well as the romantic focus and the character insight one would usually get from the novels, at the cost of saving comedy and the plot. While the plot alone is interesting, it leaves many actions and motives to the interpretation of the reader (often triggered by Kyon being an Unreliable Narrator), which makes you think about it long after you finish the book. However, the realistic Character Development of the Brigade members is also impressive. If you check out the impressively big character sheet, please beware of spoilers, even if you've finished the anime. There is also a rather substantial collection of Fan Work known collectively as Suzumiya Haruhi no Seitenkan (The Gender-Flip of Haruhi Suzumiya), which posits what would happen if all the characters in the series exchanged genders. It's worth checking out, but prepare to be confounded. ↑ Officially it's Disappearance in the English market; Japanese materials, however, are inconsistent on whether to use "Disappearance" or "Vanishment" as the translation. ↑ Alternately translated as Rashness. ↑ Alternately translated as Disturbance. ↑ Alternatively translated as Scheme. ↑ Alternatively translated as Anger. ↑ Alternatively translated as Dissociation. ↑ Alternatively translated as Surprise. ↑ Yes, this is volume 11, not 10b, in Japan, although both parts are released together in the US. This has also been confirmed not to be the last volume of the series. This page was last edited on 11 February 2019, at 01:35.